I may have a soft spot for ol' Omnivorous P.I.G., but there's no denying that the best name in Palisades' Crittaz line is "Kotton Suave." Kotton Suave is always looking for an angle. The most uninspiring resident of the South Side, he is a hustler, a wheeler dealer, who has his paws in everything and accomplishes very little. Kotton is all talk and no asubstance, always bagging about the next big thing he's working on, the next deal he's making, but never actually delivering the goods. And he never gets his own paws dirty... if someone else can do the work, he will do everything in his power to make it happen. 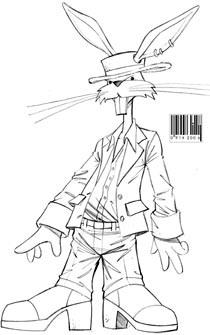 The residents of Kingdom City feel like they'd be right at home in Disney's Zootopia, though the odds that Disney would allow Kotton seem pretty slim - I mean, despite Palisades' insistence that the line would have "no emphasis on the more sinister aspects of society: no violence, no guns, no weapons, and no drugs," apparently prostitution is just fine. Because let's face it, even if his bio paints him as some kind of street hustler, Kotton Suave is a rabbit pimp. You could say he's not a pimp, but then why is he wearing a black pimp hat? You could say he's not a pimp, but then why is he wearing lavender pimp shoes? You could say he's not a pimp, but then why is he wearing a maroon leisure suit with zebra-stipe trim? You could say he's not a pimp, but the only thing he's missing is a big cane. If you knew someone who wanted to add a rabbit pimp to their collection, and you offered them Kotton Suave, they'd take him in a heartbeat, that's how much of a pimp this rabbit is. Kotton was designed by Ken Lilly, but whoever sculpted him [Jon Matthews - thanks, Palisades, for putting credits on your packaging! --ed.] was a little too loyal to the art. Lilly drew the character with a baadasssss lean, and the toy has it too. But since the toy's only articulation is the "Springfield Four" - ie, swivel joints at the neck, shoulders, and waist - he ends up with his center of balance dangerously close to his high heels, making this bunny prone to falling over backwards. And there's nothing you can do about it! 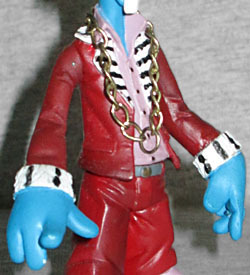 When he was first shown off at Toy Fair in 2003, Kotton Suave had a more restrained colorscheme - white fur, a brown coat and shoes, purple pants (though the shirt was still lavender and his jacket still had the same trim). If the final product had cheetah print instead of zebra stripes, we'd almost wonder if his colors were based on Pimp Daddy Destro! His fur is bright blue, making this the weirdest promotion for ice cream ever. Suave has three rings in his left ear, and wears a large golden chain. In his case, you'll actually have to open the clasp rather than slipping it over his head: you might be able to flex his ears close enough together to get the chain around them, but the loop is too small to fit past the brim of his hat. I didn't get Kotton Suave when this line was first out. I forget if that was because I saw him and didn't want him, or if I just never found him. A couple years later, I found a store that still listed the Crittaz as in-stock, but the website's programming was screwed up and couldn't accept orders - luckily, a friend lived close enough to get him (and the other figures I was missing) directly from the store. 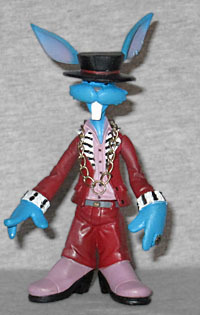 The rabbit pimp is a fun character, but you have to admit, they did miss a perfect opportunity to make him a bear.